Fifty years after Freedom Summer, To Write in the Light of Freedom offers a glimpse into the hearts of the African American youths who attended the Mississippi Freedom Schools in 1964. One of the most successful initiatives of Freedom Summer, more than forty Freedom Schools opened doors to thousands of young African American students. Here they learned civics, politics, and history, curriculum that helped them instead of the degrading lessons supporting segregation and Jim Crow and sanctioned by White Citizen's Councils. Young people enhanced their self-esteem and gained a new outlook on the future. And at more than a dozen of these schools, students wrote, edited, printed and published their own newspapers. 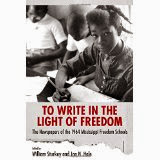 For more than five decades, the Mississippi Freedom Schools have served as powerful models of educational activism. Yet, little has been published that documents black Mississippi youths' responses to this profound experience.